On behalf of Admin of JML Law, A Professional Law Corporation posted in Car Accident on Thursday, Apr 05 2018. It is not unusual for police officers, who arrive at the scene of a car accident, to issue a traffic ticket for violating one or more traffic rules… But does receiving – or even signing – a traffic citation mean that the police think you were at-fault for causing the accident? Our Los Angeles car accident attorney from the JML Law joined us today to explain what it really means to get a traffic ticket after a motor vehicle collision in California. What does a traffic ticket mean? In reality, getting a traffic citation is not as bad as it may seem. Police officers do not give out traffic tickets just because there has been a car accident. Many accidents in California happen purely by accident – when no party has violated a traffic law – which means no ticket should be issued. Also, the police do not issue tickets when there is no immediate evidence of a violation of traffic rules (though it does not necessarily mean that there were no violations). If police officers have solid evidence that you were the one who violated traffic rules – or both you and the other driver broke the law in that collision – you will be handed over a traffic ticket, which must be signed. No, our Los Angeles car accident lawyer says. Just because you received a citation does not automatically make you the at-fault driver nor does it prevent you from recovering damages after a car crash. Does a traffic citation mean you were at-fault? A traffic ticket merely means that you violated a traffic rule, but neither amounts to a proof of your guilt nor prohibits you from recovering compensation for your injuries, damages, and losses. Our best car accident attorneys in Los Angeles at the JML Law explain that it is up to your lawyer to investigate your accident, determine fault, and evaluate the full value of damages. A ticket does not automatically make you the at-fault party, as you are still entitled to seek compensation through a personal injury claim. However, it is true that if you were issued a traffic citation and the other driver was not – and you believe the other driver was at-fault – that other driver may attempt to use the fact that you received a ticket as proof of his or her innocence. Simply put, you will need a skilled Los Angeles car accident attorney by your side to dispute his/her claims, and establish liability and fault. Can you contest a traffic citation? If you have been issued a traffic citation but you do not agree with the police that you violated traffic laws, you can contest the citation in court and ask for a trial. This is your right. It does not mean, however, that you should refuse to accept the ticket at the scene of the car accident. You do not want to get into even more trouble and hurt your chances of obtaining compensation after the accident. Instead, accept a traffic ticket once it has been issued and sign it. 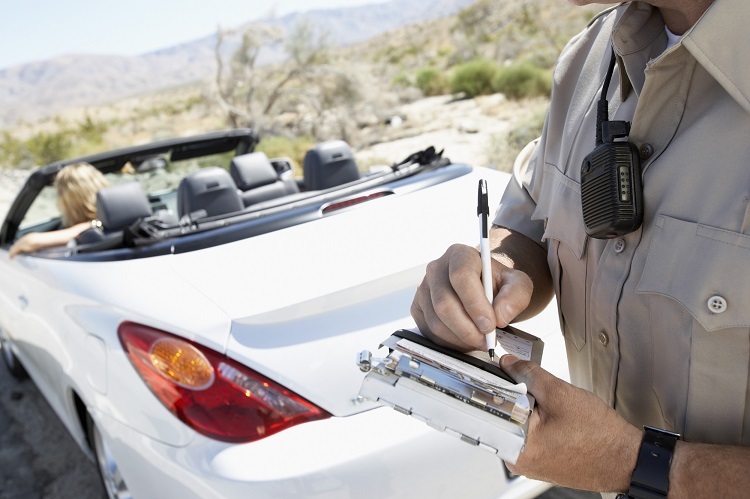 If you wish to contest a traffic citation, your attorney may be able to help you negotiate with the prosecutor a plea to place you on a probationary period. Also, you will most likely have to pay a fine and be required to attend a defensive driving course. Once you have completed all of the requirements, the citation will no longer appear on your driving record. Contact our attorneys at the JML Law to speak about your case. Call our offices at 818-610-8800 or send us an email to get a free consultation today.